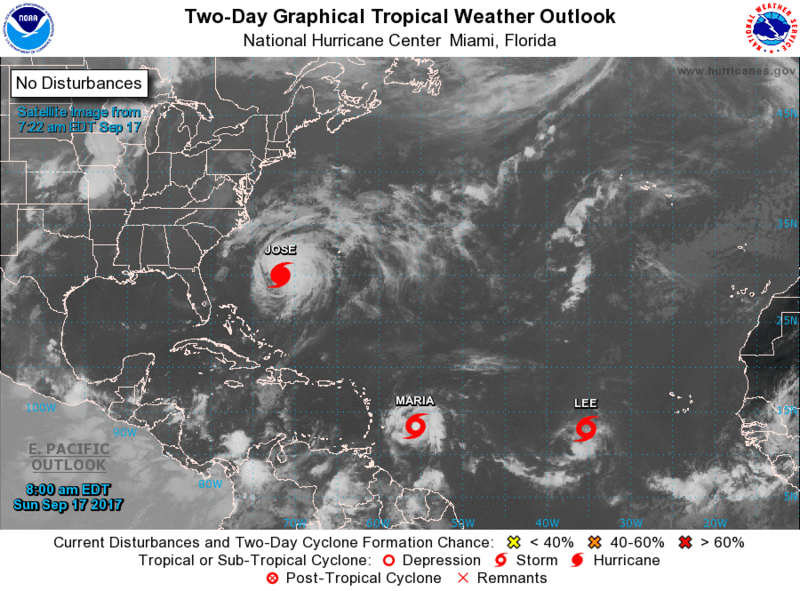 With tropical storm, Maria expected to reach strong Hurricane force later today and tropical Storm Lee not far behind and both heading Northwest the recent devastation caused by Harvey, Irma and Jose may yet not be over for the Caribbean and Florida. Following the development of Tropical Storm Lee, budding Hurricane Maria poses a significant threat to Irma-devastated areas in the northern Caribbean early this week. Tropical Storm Maria, is located less than 600 miles east-southeast of the Lesser Antilles but that's not good because there is plenty of warm Caribbean water between which is like jet fuel for a Hurricane and presents the biggest risk to land as it continues to gain strength over the coming days. According to AccuWeather.com people in the Lesser Antilles should be preparing for yet another impactful tropical system. Maria will quickly track to the west or west-northwest the next few days. Conditions are conducive for the storm to ramp up into a Category 2 hurricane prior to reaching the Lesser Antilles on Monday night and Tuesday. This is the third tropical system to impact the area in two weeks, following major hurricanes Irma and Jose during the first week of September. While it is unlikely that the storm will reach Irma’s intense strength by the time it approaches, the brisk pace of the storm means there is little time for preparations to be completed on the islands. Seas will build along the east-facing beaches of the Leeward Islands as the strengthening storm approaches on Sunday and Monday. Torrential rain and damaging winds will then increase on Monday night and into Tuesday. Some of the islands that were largely spared from Irma’s wrath may take a direct hit from the storm, including Montserrat, Guadeloupe, Dominica and Martinique. Residents should prepare for widespread tree damage, days to weeks of power outages and structural damage at the hands of a Category 2 hurricane. Well-constructed homes may sustain major roof or siding damage. "Rainfall amounts of 100-200 mm (4-8 inches) and storm surge will lead to flooding," AccuWeather Meteorologist Jordan Root said.